On the run: 4 on the Fourth | Fit Girl. Happy Girl. On the 4th of July, there’s a race held in York, Maine (where my family vacations and practically my home away from home), every year. It’s called the Four on the Fourth and it’s a 4-mile run starting at the high school, looping around and eventually coming down the road that runs parallel to the ocean. I had always wanted to do the race but never did because I wasn’t a runner. This year was different. This year I was a runner so I registered for the race. The Four on the Fourth was also my first “official” race that I’ve run, even though I’ve been training hard other races for a few months. I was very excited for this race, so much so that I couldn’t really sleep the night before and woke up before my alarm. When I got up, I looked out the window and saw it was raining. Crap. I knew that would slow down my pace and affect my finish time but there’s no getting in the way of mother nature. I was running the race with my cousin, Paige, who’s also been training for the half with me, my friend, Lindsay, and my Uncle Joe. We are all at different levels in our running- Paige is all about speed, I’m more about distance, Lindsay is a 5-k runner and my Uncle is a recreational runner. I decided to stick with Lindsay throughout the run to keep pace with her because it was her first 4-miler. As we stood at the start line and the national anthem was sung, the rain started coming down harder. We were already there so there was no turning back now. The gun shot and we were off. The first two miles went really well but as we turned onto the ocean road, the rain was literally pelting us in the face. In fact, it was kind of hard to see. But as we passed the 3-mile marker, Lindsay looked at her watch and realized we were really going at a good pace. As we approached the corner to turn into the final half mile my whole family was on the corner cheering for us and I got a burst of energy. I came in to the finish line with a final time of 37:16 which I was really pleased with given the conditions. As many of you who may read my blog often know, I’m currently training for a half-marathon at the end of September. 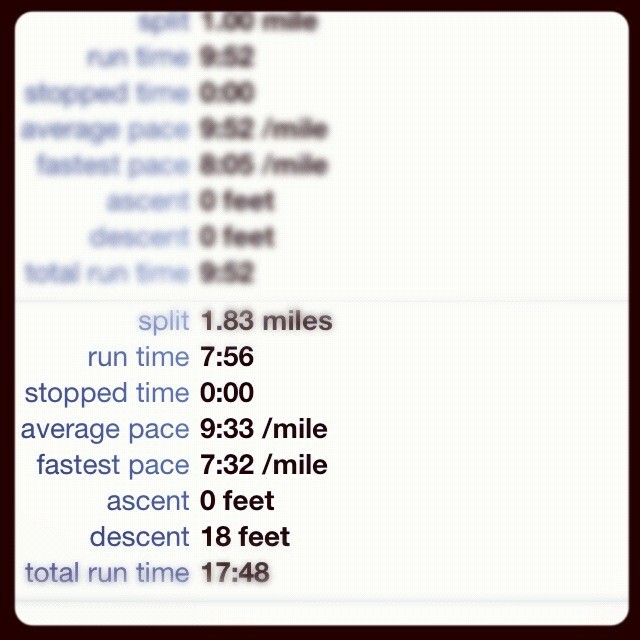 My training has been going pretty great and I’ve been working hard on increasing my mileage and increasing my speed. Part of the latter of that plan is including “tempo” runs in my weekly workout. I definitely attribute these runs to my final time at the Four on the Fourth. I did a tempo run last week and ran my fastest pace yet at 7:32. It’s hard to believe that only four months ago I could barely run a mile and now I’m running more than I could have imagined and absolutely loving it. It sounds so cliche but if you believe in yourself, you really can accomplish anything.